Master Mind | Key to unlocking your child’s inner genius ! Pick and mix colors using color coding chips. Play memory and logic games involving colors. Taco Says & Follow Me is a memory skill game. Find the Secret Code is a code solving game of 2 levels involving Logical thinking using process of elimination. Learn to Code is a game that introduces young kids to the basics of Computational thinking concepts such as pattern recognition and algorithm design using simple "forward”, "backward”, "left” and "right” instructions. Yes or No is a game where the player has to respond to simple "Yes” or "No” to trivia questions that generated randomly. INVITATION TO PLAY: Play & Learn in any language : record your own questions. 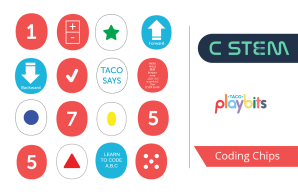 Games - Learn to Code, Taco Says, Find|Mix Colours, Discover Shape, Follow Me & Find the Secret Code, Yes or No.